71 registered members (Alan_nc), 417 guests, and 277 spiders. 1967 Lightning with 3,558 original miles!! Bought from the original owners estate. All complete and no rust in the gas tank!!! I may start a restro/start up thread!! Wow, that is quite a find. My favorite one year only! Good for you! Nice. Looks great as it is! The kind of bike I would clean up and fix up a bit ... and ride. Thanks Gents yes it will clean up nicely and be ridden!! Kurt I'm familiar with that track I grew up about 10 miles away. Did you know Greg Edmonds, Don Smolinski or Tom Lambert? They all ran that circuit I believe. Lannis, thats creepy , my first big bike too also in blue, but Tbolt single carb, wrote it off on October the 29th 1979. Not my first BSA though ,passed my test on a c15. kept the motor and the back light , the rest was wrecked. The bike that converted me to electronic ignition. two weeks wages for a Boyer back then! TD, for your first Britbike, you lucked out big time! It's very rare to find a bike of that vintage in that kind of original condition. And a '67 Lightning! I'm with KC on that being the prettiest year for the A65. My first bike was a '67 Lightning, bought in 1972. I rode, maintained, rebuilt, rode, restored, rode, rebuilt, rode (and so on) that bike until 2001. Retired until 2016, it is now being rebuilt and restored by my son. 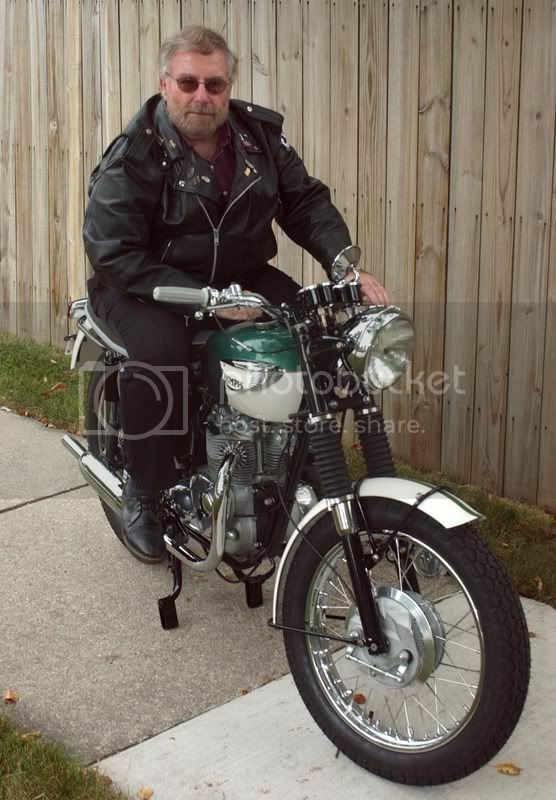 I'm now riding the A65 bitsa pictured in my avatar. I was fortunate also in finding that '67 fuel tank at a swap meet, with no rust it in. That bike is so close to original that there are one or two things you may want to correct. 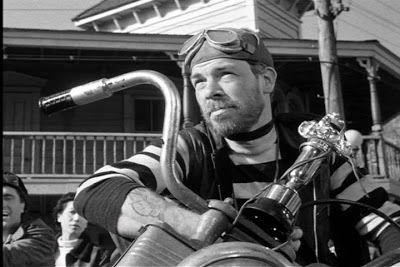 For one, the coils are supposed to be mounted behind the carburetors. Also, the routing of the throttle cables is bizarre. They must have been borrowed off a bike with ape-hanger handlebars. The piece in the back mounted in place of the grab rail is not stock, but it looks damn handy for mounting saddlebag brackets - in fact that may be why it's there. Good luck with it, I hope it runs as good as it looks! Oh, one more thing... If those Monobloc carburetors perform satisfactorily (don't stick or leak, idle consistently), don't mess with them until or unless there's a problem. Fettling with them tends to cause more problems than it cures. Thanks Mark. 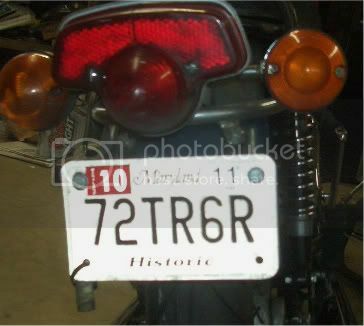 I,m sorry for the confusion, I have owned BritBikes in the past and for the past 10 years my everyday rider is a '72 TR-6R. I have fettled with many BritBikes but this is the 1st BSA. Will keep you all informed. Any idea of value for this bike? "with 3,558 original miles!" , big pinch of salt needed, and quite a few other non original miles as well, enough time/miles to wear out the OEM front tyre, remount the coils , get the headers loose in the heads and add touring accessories. My first bike was a 1967 Lightning in...blue, that I bought in 1972! Oh... yes, you did say "First BSA". Ok then, you know about AMAL carbs (but maybe not Monoblocs) and Lucas electrics. Can't answer your question about value because I'm neither a buyer, a seller, nor a collector. (Dollar value is only relevant if you plan on selling it.) If you do plan on selling it, you'll profit most by selling it as is. That is, if you rebuild and/or restore it, you'll never recoup what you've put into it. Look at the soot around the exhaust ports. Great pics, back brake shoes worn down to the rivets, cracks in the mudguard, In 3.500 miles. hmmm. That chrome came up well. I was only going by the clock reading, then I discovered the speedo cable is broken.........no clue of the actual mileage but it's not alot. The tyres appear to be original as evidenced by the Dealers signature on the rear tyre in red grease pencil. I really don't know. I do know that it is in very good original condition. Tiger Dale, you did really well on this deal. Original paint is not faded (rare for this color red) and although the bars appear high, they are ORIGINAL for this year and model. nice bike indeed. I am with the others questioning the 3,500 mls theory in my case when looking at the state of wear/elongation of the primary chain. After all it is a beautiful original bike with seems to have little mileage. Have fun and use it as the makers intended. This will be added to what I drained from the oil bottle and goes back into it for the initial start up and heat cycle then out it goes. Deciding on what oil filter I will install. I'm familiar with the Norton spin off as that is what I have on the '72 Tiger. Any other/better suggestions or examples of the bracket set up for the Norton will be appreciated.